Cold River | So Many Exciting and Beautiful Places! We arrived at Caudebec-en-Caux sometime during the night. Caudebec is the Gallicization of Kaldr bekkr, Norwegian for cold river. However, the air was even colder, with steam rising from the river. Temperatures have been in the low 40’s to mid 50’s. Caudebec is located in the northern part of Normandy, named for the Vikings who invaded and then settled in the area. England once had dominion over Normandy and one of Queen Elizabeth’s titles is Duke of Normandy. The implication by our guide was that the English have never given up their claim, even though this is legally part of France. Further research reveals that the Channel islands of Guernsey and Jersey, although possessions of the British Crown, are part of Normandy. That story is certainly not as scintillating as the one told us by our guide. This morning’s tour included the Jumièges Abbey and the Fontenelle Abbey, both just a short distance from Caudebec. The Jumièges Abbey was founded 654 AD by St. Philibert as a Benedictine Monastery. It was destroyed by the Vikings in 841 and again during the Hundred Years War. After the French Revolution, the abbey was sold for a stone quarry. Most of the structures were dismantled and the stone removed. Only about 1/3 of the original abbey is visible today. The towers of the abbey are not symmetrical. One is more rounded than the other. It was believed that only God can create perfection, so imperfections must be deliberately built into any work created by humans. Oyster mushrooms? Really, really big. There are several yew trees on the property, one over 500 years of age. The yew tree was valued by the monarchs because its wood is poisonous. An arrow made from the yew tree would poison its victim. All parts of the yew are poisonous except for the red berry (aril) that contains the seed (yes, it’s poisonous as well.) Birds can eat the berry, and the seed passes through the digestive system to be dropped elsewhere. Frontonelle Abbey is located in the Village of Saint-Wandrille-Rançon. Founded in 649, this abbey, too, was destroyed a couple of times. Saint-Wandrille was born to a noble family, and served in the court of Frankish king Dagobert. He married, but he and his wife later separated so both could enter the religious life. Frontonelle is an active monastery with about 50 monks, and one novice. In keeping with the order of Benedict, the monks work to support themselves, with candle making, fine arts, and a reprographic studio. They also sell recordings of Gregorian chants, which they sing during morning prayers. The modern church used by the monks is quite simple, with none of the ornateness seen in most medieval churches. Many of the houses in Normandy are designed to look like they are wood frame, although they are usually made of stone. In some cases, actual wood is fastened to the sides, in others, the design is painted on. Caudebec is a charming little town, and we spent a little time exploring after lunch. In years past, the citizens could only cross the river by ferry. Toll bridges were built, but the Brotonne Bridge is used mostly by the local residents. The tolls being collected were not enough to cover the salary of the attendant, so now it is a free bridge. Real? Appears to be painted on. It seems every French town has a Notre Dame Church, and Caudebec is no exception. We remain in port overnight, and will be headed to the Normandy Beaches in the morning. 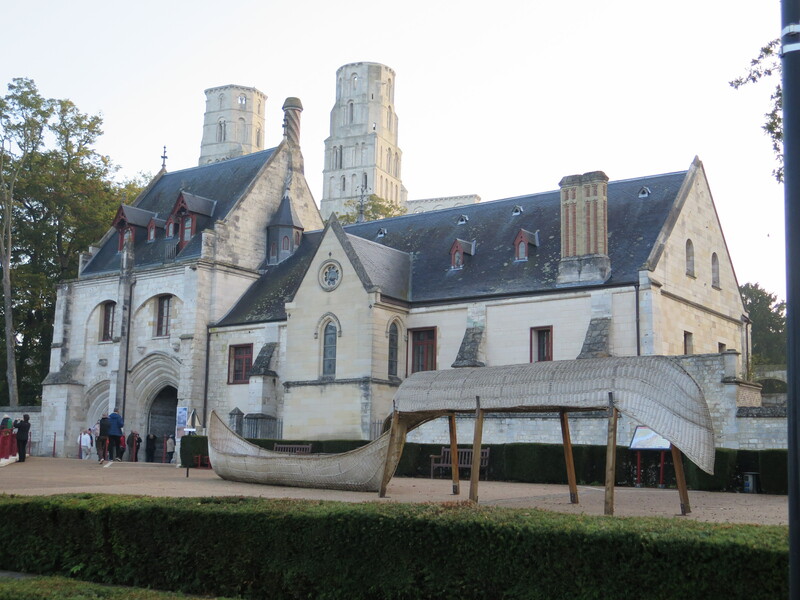 This entry was posted in Europe, France and tagged Fontenelle Abbey, Jumieges Abbey. Bookmark the permalink.